Pedro de la Gasca, to whom the Spanish king had entrusted rule over the former Inca lands, commanded Captain Alonso de Mendoza to found a new city commemorating the end of the civil wars in Peru. 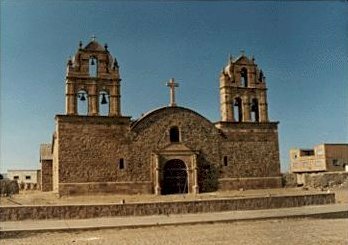 Then the city of La Paz was founded on October 20th, 1548 under the name of La Ciudad de Nuestra Señora de La Paz (The City of Our Lady of Peace). 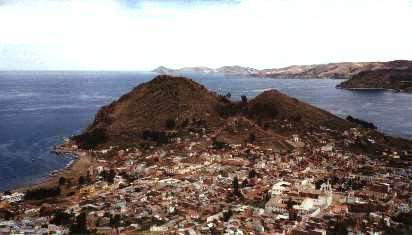 The city was first established in what today is Laja, on the Tiahuanaco road. Shortly after its founding, La Paz was moved to its present location, in the valley of the Chuquiago Marka. On 1549, Juan Gutierrez Paniagua was commanded to design and urban plan that will designate sites for public areas, plazas, official buildings. 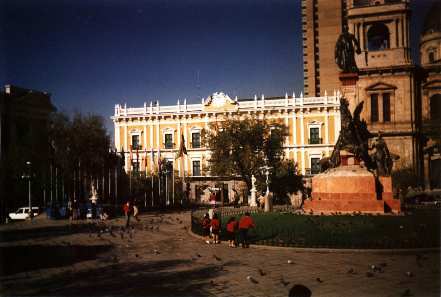 La Plaza de los Españoles, what today constitutes the Plaza Murillo, was chosen as the location for government buildings as well as the cathedral. Spain controlled La Paz with a firm grip and the Spanish king had the last word in all matters political. In 1781, for a total of six months, a group of Aymara people laid siege to the no longer peaceful city of La Paz. Under the leadership of Tupac Katari, they destroyed churches and government property. Thirty years later Indians laid a two-month siege on La Paz. In 1809 the struggle for independence from the Spanish rule brought uprisings against the royalist forces. Today La Paz is a vibrant city, growing and expanding in all directions. La Paz has a population of more than a million inhabitants. La Paz is the official government site. 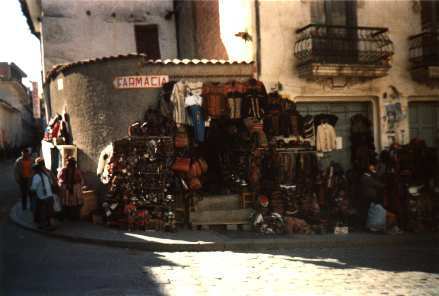 La Paz offers multiple micro-climates according to each zone's altitude. While the center of town is at 3,650 meters above sea level, the zone of Aranjuez is at 3,300 m. El Alto (where the international airport is located) is at 4,082 m. The average temperature in winter is 15C (59F) and 22C (72F) in summer. In the summer, rain falls on most afternoons. In the winter, days are slightly cooler, but the sky is mostly clear and sunny. From any main city in the country through the following airlines: LAB, AEROSUR, and TAM. Presidential Palace: Also known as the Palacio Quemado (Burnt Palace) due to repeated fire episodes the building endured in the past. 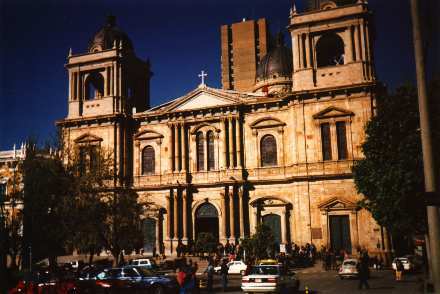 The Cathedral: Built in 1835, the cathedral is an impressive building worth seeing. It is located in the Plaza Murillo nest to the Presidential Palace. Casa de Pedro Domingo Murillo: Once the house of Pedro Domingo Murillo, martyr of the independence revolution of 1809 (hanged in the plaza that now bores his name) the house displays a collection of furniture, textiles, and art from colonial times. Museo Costumbrista: Displays amazing ceramic dolls wearing traditional customs that show how was life in the early 1800's. Also displays are photos of old La Paz. Museo Nacional de Arqueología: Depicts a collection of artifacts of the Tiahuanacu culture. Museo del Litoral: Displays objects from the 1879 war in which Bolivia lost its sea coast to Chile. Museo del Oro: Depicts pre-Conquest works made of gold, silver and copper. Museo de Etnografía y Folklore: House built in the late 1700's exhibits customs and art of two ethnic groups: Chipayas and Ayoreos. Museo del Charango: Located in Calle Linares, the museum displays an incredible variety of charangos. Other native instruments are displayed as well. Museo de Historia Natural: Exhibits on Bolivia's paleontology, geology, paleontology, zoology, and botany. Casa Museo Marina Nuñez del Prado: Displays Quechua and Aymara-theme sculptures by Bolivian artist Marina Nuñez del Prado. Museo Nacional de Arte: Located in calle Comercio, this former palace, built in 1775, houses works by Melchor Perez de Holguín and Marina Nuñez del Prado, among others. Feria de Alasitas: This fair is celebrated each year on January 24 in honor of a little god of abundance known as Ekeko, which means dwarf in Aymara. Valle de la Luna (Moon Valley): Located at about 10 Km from the city center, this eroded hillside maze of canyons and pinnacles creates a wonderful view. Tiahuanaco: Ruins of an ancient city built over 1,000 years ago by the Tiahuancu people. One of the most fascinating places to visit. Titikaka Lake: The highest lake in the world offers a wonderful view of magical surroundings and enchanted waters. Copacabana: Town located on the shores of the Titikaka lake. It attracts hundreds of pilgrims each year for the Virgin of Copacabana festivities.